One track, from D-A-D’s bonus album Behind The Seen, has leaked out from the upcoming Overmuch Box. Listen to Look What The Drug Dragged In on the band’s MySpace page at www.myspace.com/dad! Plus D.A.D’s first release ever, the EP “Standin’ On The Never Never” (1985) – remastered and for the first time to be released on a CD. The Overmuch Box also contains the bonus album: “Behind The Seen” (2009) including 8 never previously released tracks, plus 10 rare b-s ides and bonus tracks. And a book in English, about the life and times of D.A.D, based on a number of recent interviews with the band, by author Michael Valeur. The 160 pages are generously illustrated by D.A.D. bass player Stig Pedersen. 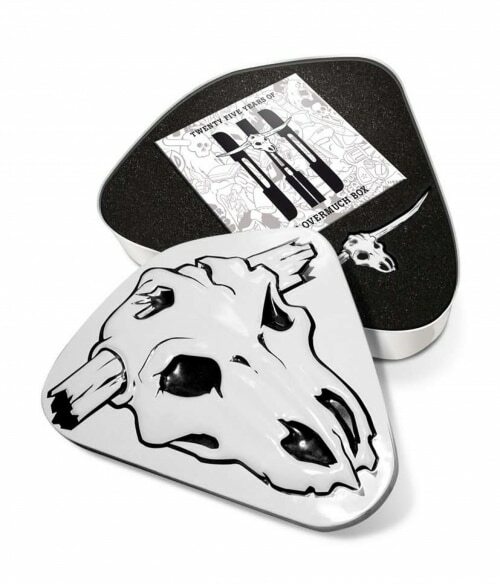 Besides the regular version, The Overmuch Box comes as a DELUXE LIMITED EDITION, in a cow skull shaped metal box containing both The Overmuch Box and a cow skull shaped USB key. The 2 GB USB contains all 10 studio albums, the “Standin’ On The Never Never” EP, the “Behind The Seen” bonus album, plus ultra rare live recordings, not available anywhere else!!! We are happy to announce that D.A.D. Net Pets can pre-order this exclusive limited collectible in the D.A.D. Webshop now. As a special extra bonus, copies purchased through the Webshop before November 1st, will be signed by the band. All orders will be handled and shipped a few days prior to release. Depending on the postal system, Danish costumers should be able to receive the box on the release day, November 16th, or just after – others may have to wait a bit longer, depending on local postal handling. The regular edition of “D.A.D – The Overmuch Box” can not be pre-ordered right now, but will be available in the Webshop from around the official release date, at 54.00 Euros plus handling. The Limited Edition of “D.A.D – The Overmuch Box”, can be pre-ordered now, at 94.00 Euros plus handling.